Oh great googily-moogily, the X-F-L… Admittedly, I was a fan early on, as I was looking for an alternative to the NFL (though Arena Football was already scratching that itch). I had no issues with the NFL then (like I do now), but competition in the pro sports realm can be a positive thing. 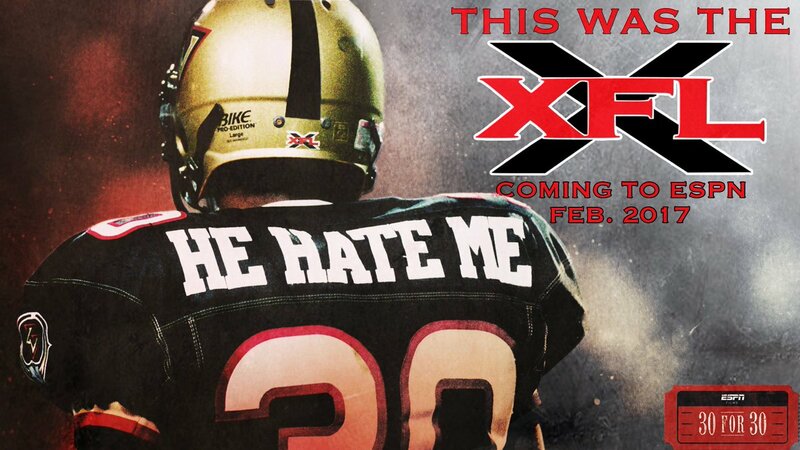 Well, we know how the XFL ended (not well), but this coming Super Bowl week in 2017, ESPN will debut it’s newest installment of their famed 30 for 30 series with the unbelievably-highly-anticipated “This Was The XFL”. Between that, ESPN’s coverage of the WWE on SportsCenter, and the 30 For 30 series working on a Ric Flair documentary, I am super amped! The free exhibit, which will be open to the public on Jan. 14 at the Helen Mills Event Space and Theater in Chelsea, will feature team helmets and jerseys (like that iconic He Hate Me jersey worn by Rod Smart), the trademark black footballs, championship trophies, as well as surprise appearances by XFL stars. So, should you live in the New York area, and you enjoy football or wrestling, you may want to set some time aside to check out the XFL Hall of Fame (since it’ll only be up for a single day). Also, if you DO go, take a picture of yourself next to the silliest (i.e., best) piece of memorabilia, post it on social media and share it our way. It would be greatly appreciated. PLSKTHXBAI!